Europe’s Ariane 5 rocket rolled out to its French Guiana launch pad in preparation for a Thursday liftoff on the vehicle’s year-opening mission, tasked with deploying a pair of innovative satellites to a Supersynchronous Transfer Orbit peaking 45,000 Kilometers above the planet. Stacked underneath the rocket’s protective fairing, the SES 14 and Al Yah 3 communications satellites are targeting liftoff during a 45-minute launch window opening at 22:20 UTC. Thursday’s mission will open what is expected to be a record-setting year for Arianespace with 14 missions on the manifest for 2018: the Ariane 5 workhorse is planned to conduct up to seven missions, five dual-satellite Geotransfer missions and two ESA-contracted missions in support of the Galileo navigation constellation and the BepiColombo mission setting out to explore Mercury. Soyuz has up to four missions on its South America manifest in 2018 including the first delivery for the OneWeb Internet Constellation, and the light-lift Vega rocket will make up to three launches highlighted by the ADM Aeolus mission for ESA. 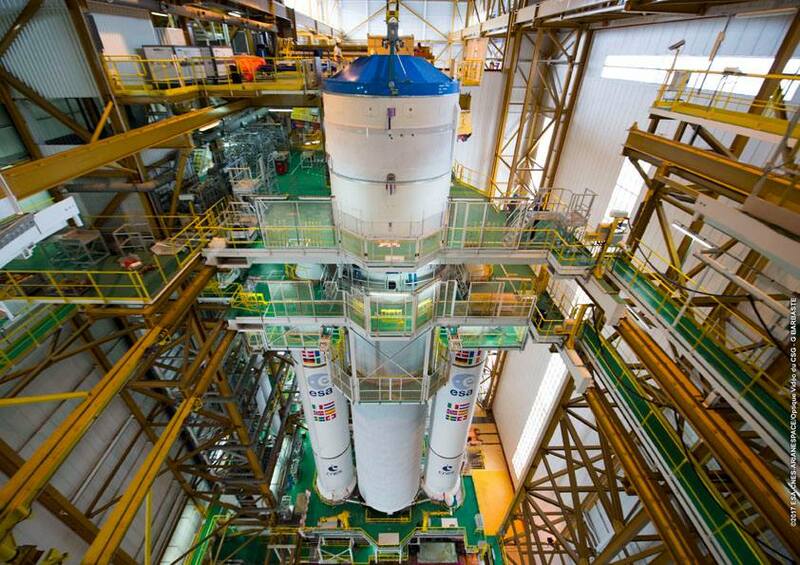 The year-opener for the Ariane 5 heavy-lifter involves a pair of innovative, yet different satellites. Riding in the upper payload slot is the 4,423-Kilogram SES 14 communications satellite built by Airbus Defence and Space for operation by Luxembourg-based SES while the lower payload slot is occupied by the Orbital ATK-built Al Yah 3, weighing in at 3,795 Kilograms and set for commercial service under operation by YahSat, headquartered in the United Arab Emirates. SES 14 is the second satellite based on the all-electric Eurostar-3000EOR satellite platform, developed by Airbus in response to a trend toward hybrid and all-electric satellites – minimizing platform mass for more cost-effective launch opportunities while maximizing payload capacity, both for mass and power. 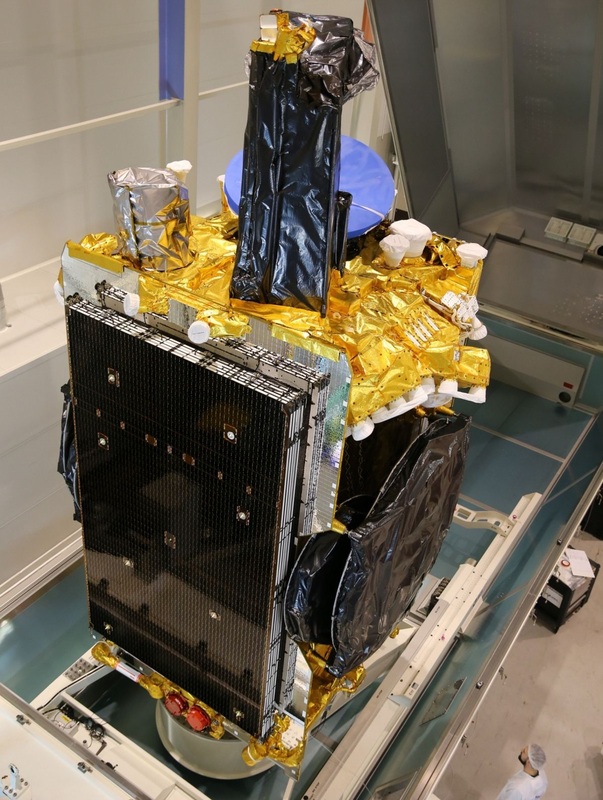 The EOR platform of the Eurostar-3000 product line was first used by the Eutelsat 172B satellite that launched in May 2017 and Airbus has at least another six orders for EOR satellites after SES 14. SES 14, the 53rd SES satellite launched by Arianespace, hosts a high-power C- and Ku-Band payload to deliver Direct-to-Home television, cable broadcasting, aeronautical & maritime connectivity, broadband Internet and cellular backhaul to the Americas, the North Atlantic Corridor, Europe and Western Africa. The satellite’s payload comprises 20 Ku-Band and 28 C-Band transponders using a combination of wide-beam C- and Ku-Band coverage for broadcasting services while a large number of narrow Ku-Band beams will carry high-throughput data services. The SES 14 satellite also marks a milestone for NASA as the first commercial geostationary satellite to host an instrument for the agency. Mounted on the Earth-facing panel of the satellite is GOLD – the Global-scale Observations of the Limb and Disk Instrument. 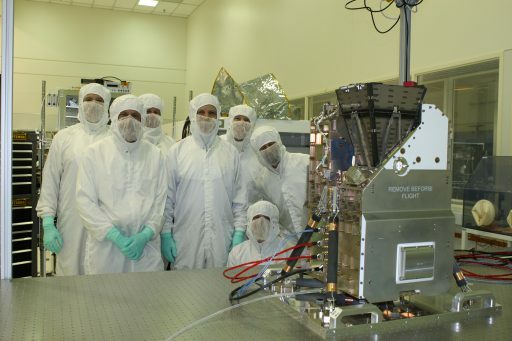 Weighing in at 37 Kilograms, the compact instrument package dips into the resources of the SES 14 satellite – utilizing its pointing system to provide a stable platform for the instrument, receiving power from the spacecraft (taking advantage of increased power margins early in the mission) and using the satellite’s communications system to send data to the ground. GOLD comprises two Far Ultraviolet Spectrographs, operating in unison to capture one complete image of Earth’s Ionosphere and Thermosphere every half hour across a wavelength range of 132 to 162 nanometers for the first-ever comprehensive measurement of processes ongoing in a region where influx from the sun meets Earth’s atmosphere. The primary objective of GOLD is separating spatial and temporal phenomena in the upper reaches of the atmosphere to shed new light on space weather dynamics and their driving forces. The passenger riding underneath the Sylda Adapter is Al Yah 3, the third satellite in YahSat’s fleet and its most powerful to date. 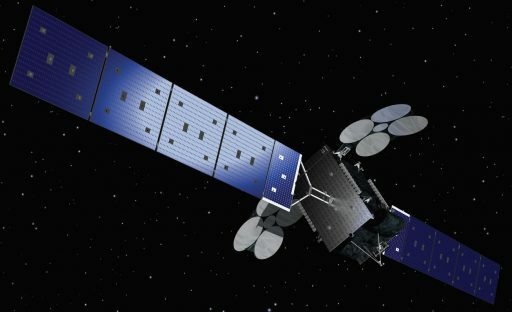 Al Yah 3 is the first satellite based on Orbital ATK’s GEOStar-3 satellite platform, the company’s largest geostationary spacecraft bus to date. GEOStar-3 takes advantage of experience from nearly three dozen GEOStar-2 missions and incorporates an enhanced electrical power system, a number of structural improvements and adds an advanced Electric Propulsion System using Hall Current Thrusters to create a hybrid solution using chemical thrusters for the initial orbit-raising before electric propulsion takes over for Stationkeeping. Through these improvements, GEOStar-3 can support a payload power of 8 Kilowatts vs. 5kW for GEOStar-2. As the first satellite based on a brand new platform, Al Yah 3 not unexpectedly slipped considerably from its initial completion date, incurring a schedule overrun of nearly one year. 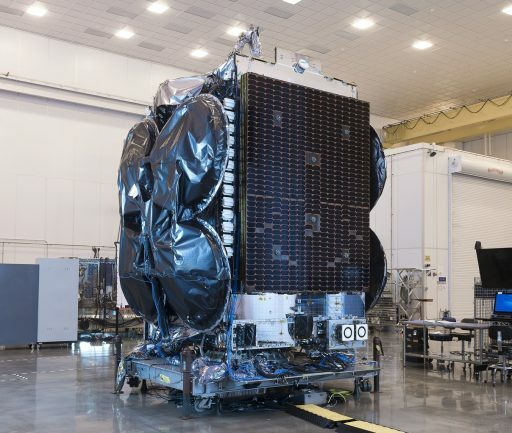 Delays were exacerbated by the inherent complexity of high-throughput satellites compared to traditional communications satellites, making Al Yah 3 the most complicated satellite ever built by Orbital ATK. The satellite is outfitted with a high-throughput Ka-Band payload that delivers 53 high-power user beams for high-speed data services for end-user applications as well as IP backhaul for telecommunications service providers. Al Yah 3, stationed over the Atlantic Ocean, will reach 60% of Africa’s and over 95% of Brazil’s population, allowing YahSat to enter twenty previously unexplored market areas. 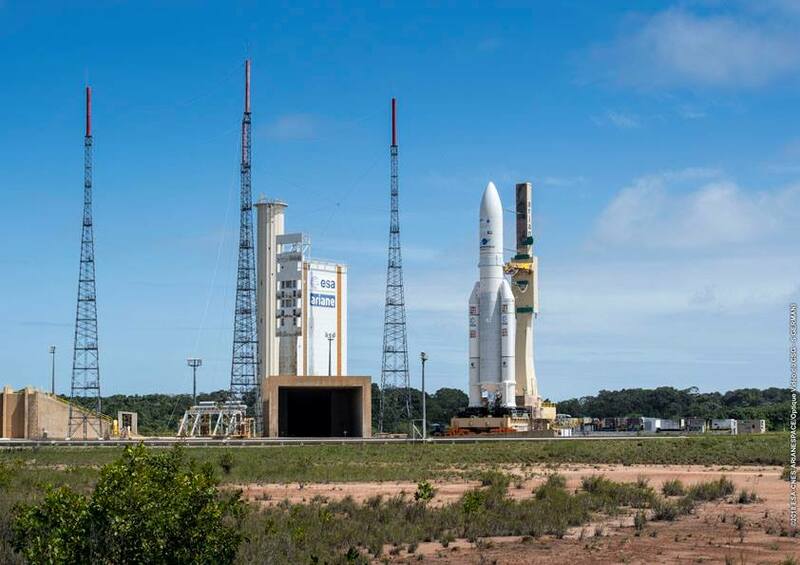 A number of telecommunications providers have already booked capacity on the satellite including the Konnect Africa venture of Paris-based Eutelsat and network operator Talia. 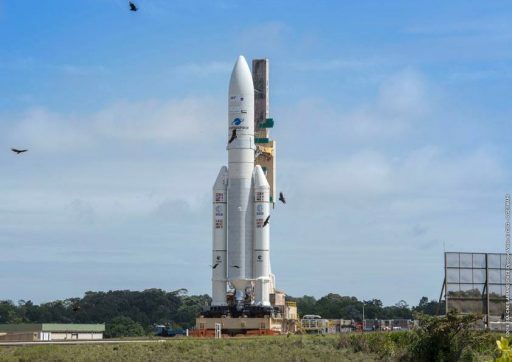 The Ariane 5 VA 241 mission is carrying a total payload upmass of 9,123 Kilograms, represented by the two satellites and their launch vehicle adapters. This does not get close to the rocket’s theoretical GTO capacity around 10.8 metric tons, allowing Ariane 5 to use surplus performance for additional inclination reduction to three degrees and to lift the orbit’s apogee above the typical GTO-injection of 35,800 Kilometers in a rare Supersynchronous mission by the vehicle. 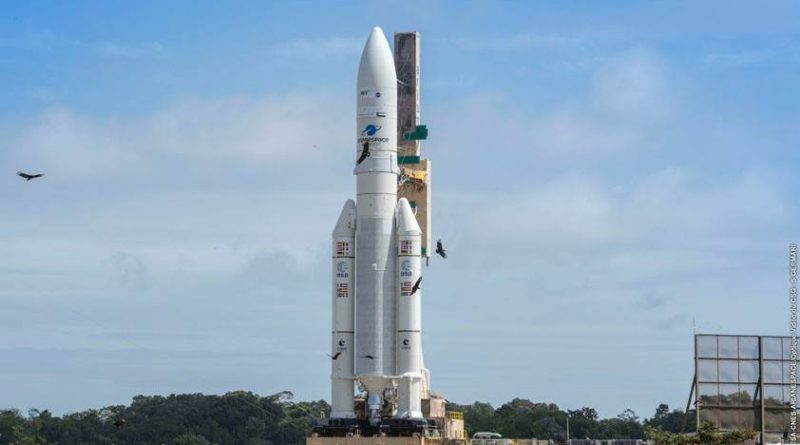 Ariane 5 emerged from the Final Assembly Building on Wednesday for a 2.7-Kilometer trip over to the ELA-3 launch pad where the rocket was carefully placed atop its launch table for the final 24-hour launch preparation process. Countdown operations will formally begin at 10:57 UTC, eleven hours and 23 minutes before the day’s launch window opens at 7:20 p.m. local time. Upon ignition of the twin boosters, Ariane 5 will jump off its launch pad with a thrust of 1,420 metric ton-force, balancing in a vertical position for six seconds before initiating the pitch and roll maneuvers that align the rocket with its due easterly departure path across the Atlantic Ocean. Ariane will pass the speed of sound 49 seconds into the flight followed twenty seconds later by Maximum Dynamic Pressure. The 31.6-meter long boosters will finish their job two minutes and 19 seconds into the mission via a pyrotechnic separation from the core stage which will continue uphill powered by the single Vulcain 2 main engine, guzzling down 300 Kilograms of cryogenics every second of flight. 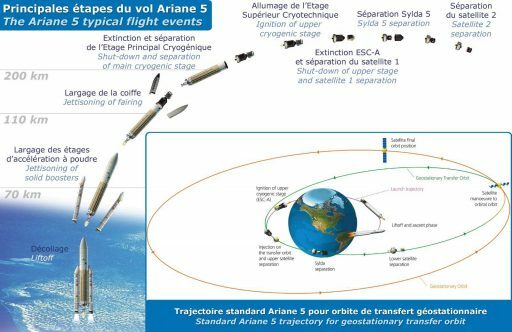 Three minutes and 18 seconds into the launch, Ariane 5 will be sufficiently high in altitude to drop its two fairing halves, revealing the dual-payload stack for the rest of the journey into orbit. The core stage will shut down at T+8 minutes and 51 seconds and separate from the upper stage seven seconds later to clear the way for ignition of the 62.7-Kilonewton HM-7B engine at T+9:01. The upper stage will fire for 15 minutes and 45 seconds to boost the vehicle’s speed to 9.498 Kilometers per second in order to reach the desired elliptical orbit of 250 by 45,000 Kilometers, inclined 3 degrees. After injection, 25 minutes into the flight, Stage 2 will employ its cold gas thrusters for an elaborate orbital dance – separating SES-14 at T+27 minutes, dropping the Sylda at T+33 minutes and sending off Al Yah 3 at T+35 minutes – all headed into slightly different directions to ensure no close encounters in the hours and days after launch.